“Not one more victim,” chanted community members on October 18th during Mujeres Latinas en Acción’s annual march against domestic violence. 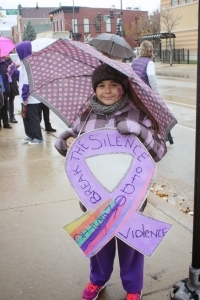 Rain did not deter the crowd made up of families who carried posters and waved banners bringing attention around the issue of domestic violence in Chicago. According to Mujeres Latinas en Acción, one in four women and one in seven men have been the victim of severe physical violence by an intimate partner in their lifetime. Throughout Pilsen, staff, volunteers, community members, survivors of domestic violence, and representatives from Mujeres Latinas en Acción walked through the neighborhood chanting and called upon help from fellow residents. When it comes to domestic violence Latinas face several obstacles, such as fear of deportation, social isolation, misinformation and lack of knowledge about legal rights, and language differences. The march began at Harrison Park and concluded in front of the Mujeres Latinas en Acción office where marchers released balloons signifying an end to domestic violence. Mujeres Latinas en Acción’s mission is to spread awareness around the matter of domestic violence and call on Chicago to take action. If you would like to learn more about the efforts of Mujeres Latinas en Acción, visit www.mujereslatinasenaccion.org.